Identity for U.S. Hispanics is multidimensional and multifaceted. For example, many Hispanics tie their identity to their ancestral countries of origin – Mexico, Cuba, Peru or the Dominican Republic. They may also look to their indigenous roots. Among the many ways Hispanics see their identity is their racial background. Afro-Latinos are one of these Latino identity groups. They are characterized by their diverse views of racial identity, reflecting the complex and varied nature of race and identity among Latinos. A Pew Research Center survey of Latino adults shows that one-quarter of all U.S. Latinos self-identify as Afro-Latino, Afro-Caribbean or of African descent with roots in Latin America. This is the first time a nationally representative survey in the U.S. has asked the Latino population directly whether they considered themselves Afro-Latino. In the U.S., Latinos with Caribbean roots are more likely to identify as Afro-Latino or Afro-Caribbean than those with roots elsewhere (34% versus 22%, respectively). Those who identify as Afro-Latino are more concentrated on the East Coast and in the South than other Latinos (65% of Afro-Latinos live in these regions vs. 48% of other Latinos). They are also more likely than other Latinos to be foreign born (70% vs. 52%), less likely to have some college education (24% vs. 37%), and more likely to have lower family incomes. About six-in-ten Afro-Latinos reported family incomes below $30,000 in 2013, compared with about half of those who did not identify as Afro-Latino (62% vs. 47%). Afro-Latinos’ views of race are also unique. When asked directly about their race, only 18% of Afro-Latinos identified their race or one of their races as black. In fact, higher shares of Afro-Latinos identified as white alone or white in combination with another race (39%) or volunteered that their race or one of their races was Hispanic (24%). Only 9% identified as mixed race. These findings reflect the complexity of identity and race among Latinos. 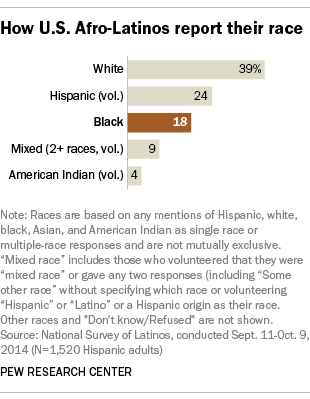 For example, two-thirds of Latinos (67%) say their Hispanic background is a part of their racial background. This is in contrast to the U.S. Census Bureau’s own classification of Hispanic identity – census survey forms have described “Hispanic” as an ethnic origin, not a race. The multiple dimensions of Hispanic identity also reflect the long colonial history of Latin America, during which mixing occurred among indigenous Americans, white Europeans, slaves from Africa and Asians. In Latin America’s colonial period, about 15 times as many African slaves were taken to Spanish and Portuguese colonies than to the U.S. Today, about 130 million people of African descent live in Latin America, making up roughly a quarter of the total population, according to estimates from the Project on Ethnicity and Race in Latin America (PERLA) at Princeton University. Until recently, most Latin American countries did not collect official statistics on ethnicity or race, especially from populations with African origins. However, a recent push for official recognition of minority groups throughout Latin America has resulted in most countries collecting race and ethnicity data on their national censuses. In 2015, for the first time ever, Mexico allowed people to identify as black or Afro-Mexican through a new question in its mid-decade survey. About 1.4 million Mexicans (or 1.2% of the population) self-identified as black or of African descent based on their culture, history or customs, according to Mexico’s chief statistical agency. 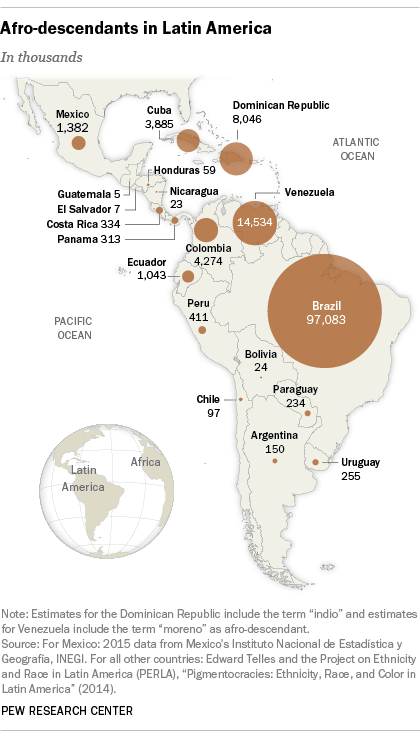 Afro-Latinos make up significant shares of the population in some corners of Latin America. In Brazil, about half of the population is of African descent (black or mixed-race black). In the Caribbean, black Cubans make up about a third of that country’s population. In the Dominican Republic, black identity is much more complicated. Estimates of Afro-descent in the Dominican Republic range from about a quarter to nearly 90% of the population depending on whether the estimates include those who identify as “indio,” a group that includes many nonwhites and mixed-race individuals with African ancestry. Gustavo López is a former research analyst focusing on Hispanics, immigration and demographics at Pew Research Center.